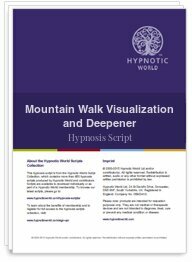 This Mountain Walk visualization and deepener script from Hypnotic World is based on a spectacular journey set in the Swiss Alps and can be used to help clients to resolve any issues in life that they are experiencing. The graphic description of this mountain journey can take your clients into a deep state of hypnosis as they become immersed in the beauty of the scenery and feel as though they are actively participating in it. Use this Mountain Walk visualization and deepener with your clients today and help them to get the best out of their session with you.